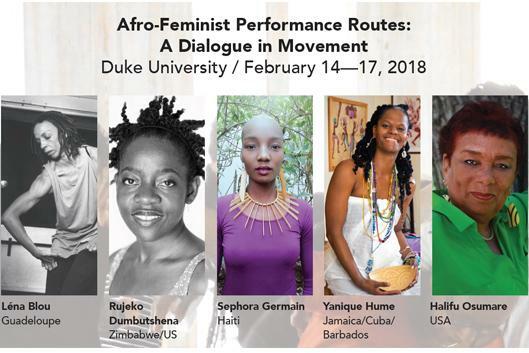 This four-day "dialogue in movement" hosts five international dance artists from Africa and its Diasporas to catalyze a dialogue around creative practice, migration, and African philosophies, as they relate to and emerge from women's perspectives. Through dance workshops, artist presentations, performances, informal conversations, and a roundtable discussion, this gathering will coalesce artists, dancers, students, faculty, and local community to explore the many manners in which movement constitutes culture, embodied practice engenders place, and migration informs subjectivity and notions of belonging. Choreographer & Scholar Halifu Osumare has been involved with dance and black popular culture internationally for over forty years as a dancer, choreographer, teacher, administrator and scholar. She holds a M.A. in Dance Ethnology and a Ph.D. in American Studies. Dr. Osumare is Professor Emerita of African American & African Studies at University of California, Davis. ). Her vision of social justice, like her late mentor Katherine Dunham, is the integration of the arts and the humanities to humanize all receptive souls.